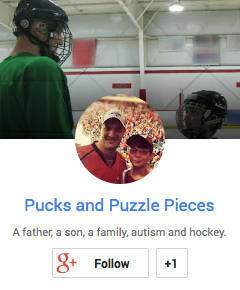 If you’ve been reading this blog, you know by now that Ryan pays a lot of attention to the NHL. After flirting with being a fan of my favorite team, Washington, he has settled on the San Jose Sharks as his no. 1. The reasons why are not entirely clear. I tried to dissuade him for practical reasons. We live in the Eastern time zone; the Sharks play in the Pacific and therefore most of their games take place after Ryan has gone to bed. But he has not budged from this position for a good three years and at this point, life-long Sharks fandom appears locked in. Ryan’s wardrobe includes many Sharks t-shirts, three Sharks jerseys, a sharks sweatshirt and a Sharks jacket. 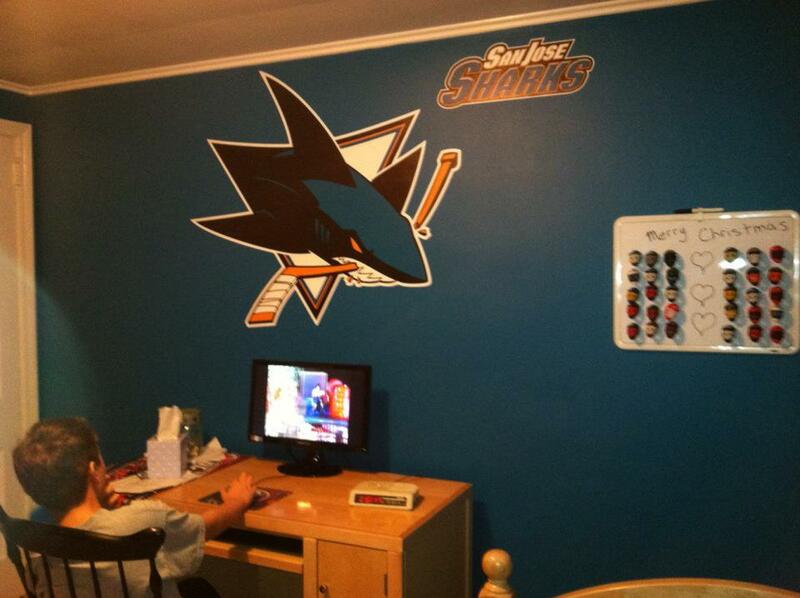 His room is painted in the team’s official teal (thanks Glidden Team Colors collection!) and decorated with a Fathead of the team logo, plus numerous pennants, photos, and other Sharks decor items. I pity the person that has to cover these walls with a neutral color. So when the Sharks come to town, or when we travel to see them play, it’s a special treat for Ryan. But that doesn’t mean he takes any less enjoyment in seeing any of the other teams play. He just loves being at hockey games. We get out to see our local team plenty, but we’ve also followed up our successful journey to Detroit with a few other road trips. 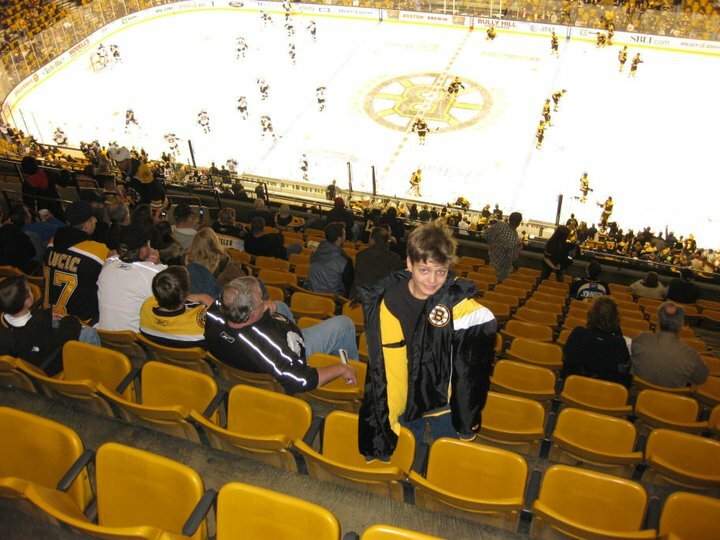 The following year, we used the same fall break long weekend to take in games in Philadelphia and Boston. The Boston trip was particularly enjoyable. We stayed in a hotel that was within walking distance of the TD Garden arena, and was full of people in town for a Saturday night game. When we pulled up, the valet saw Ryan’s Bruins jacket and asked him if we were there for the same reason. After Ryan said yes, the valet pushed his luck, asking about his his favorite player. “Joe Thornton,” Ryan answered matter-of-factly. Joe Thornton is in fact Ryan’s favorite player. But he plays for the Sharks. Worse, he began his career with the Bruins and his time in Boston ended badly. The valet did not enjoy this answer. “Joe Thornton?!?! ?” You’re killing me!” he told Ryan. I mumbled something about the Sharks and we quickly moved inside the hotel. We set out for the game early enough to grab some dinner. A friend from Boston had tipped me off to Halftime Pizza, right across the street from the arena, where the menu contains little more than pizza and beer, and where the TVs play tapes of old hockey fights. Throw in that everyone in the restaurant was wearing Bruins gear and Ryan was in heaven. After a couple slices (and a couple of pints for me), we headed to the game. Seated next to us were four 20-somethings who were friendly, but clearly had been over-served in the pre-game period. Having been the obnoxious drunk 20-something at a few sporting events myself a lifetime ago, I hoped they would be of the jolly drunk variety and not the F-bomb spewing bitter drunk variety. Luckily, they were the former. One the guys struck up a conversation. In the course of our chat he learned that Ryan and I were from out of town and that we were there because of Ryan’s love of hockey. I think our new friend saw Ryan as a young fan, eager to learn all about his team and its history. He clearly didn’t know what he was getting into. His brain was probably not functioning as quickly as it might under different circumstances, because he was having a hard time processing what Ryan was telling him — that he loved the Sharks and Joe Thornton. Getting ready to watch the Bruins from TD Garden. Undaunted, our friend tried a different approach. “Well at least you hate the Montreal Canadiens, right?” he asked. As I mentioned, the only team Ryan hates is Anaheim. He loves all the others somewhere between most (San Jose) and 29th (take your pick, it changes weekly). “Nooooo,” came the drawn out reply from Ryan. I thought about intervening in the conversation at this point, but it all seemed harmless so I let it continue. “Let me tell you something,” our friend continued. “There shouldn’t even be a team called the Montreal Canadiens!” (The Canadiens once beat Boston in 18!!! consecutive playoff series over 41 years — I’m sure our friend’s opinion is a common one in Boston). This did not compute for Ryan. No team called the Canadiens? How could there be no team called the Canadiens? They’re part of the Original Six! They’re one of the 29 teams he loves! “Oh yeah,” Ryan began his reply, his voice rising. “Well there shouldn’t even be a team called the ANAHEIM DUCKS!” He was shouting by the end. The look of confusion on our friend’s face was priceless. Now this did not compute. The Anaheim Ducks? Who talks about the Anaheim Ducks in the middle of a discussion about the Bruins-Canadiens Original Six rivalry? Ryan does — that’s who. After a lengthy pause, during which I like to to think he pondered how to convince this young fan to accept his line of thinking, our friend threw in the towel, simply repeating his statement about the Canadiens and hoping it would register this time. Ryan responded the same way. This was quickly becoming a script. Our friend just shook his head and looked at me for assistance. I laughed. With this, our friend wisely gave up, instead quizzing Ryan about the Ducks, the Sharks, and the various places he’d been to see NHL games.Their chat went on for quite a while. Like many kids on the spectrum, Ryan struggles to maintain conversation. Except, apparently, with inebriated 20-something Bruins fans. Love this conversation and Ryan held his own and then some! Now bout those Ducks….. Loved seeing black and gold. And you certainly lucked out in terms of jolly inebriate seatmates! The consensus is … a great white. As long as he likes the Pens a little he’s okay by me. No spoilers, but you should probably read Friday’s post. Thanks for reading. Even if you’re a yinz! hahaha. . . I forgot about all the crosby name-calling. That’s great! I’m sort of a newbie Yinzer. I grew up in Montana and moved to Pittsburgh for work, then just settled down here.